Thirty years after the Revolutionary War the tiny village of Greenwich was sparsely populated. It would be two decades before the outbreaks of cholera and yellow fever in the crowded city to the south forced New Yorkers to seek refuge here. An old road, renamed Christopher Street in 1799, ran along the southern boundary of Vice Admiral Sir Peter Warren’s country estate and here, around 1802, a two-and-a-half story wood fronted building was erected. A similar house sat next door at the corner of Herring Road. In March 1807 a three-member commission composed of Gouveneur Morris, surveyor Simeon De Sitt and attorney John Rutherfurd, was appointed to plot a comprehensive street plan for Manhattan – decades before most citizens could imagine the city engulfing the island. The three men met in the tiny corner structure. 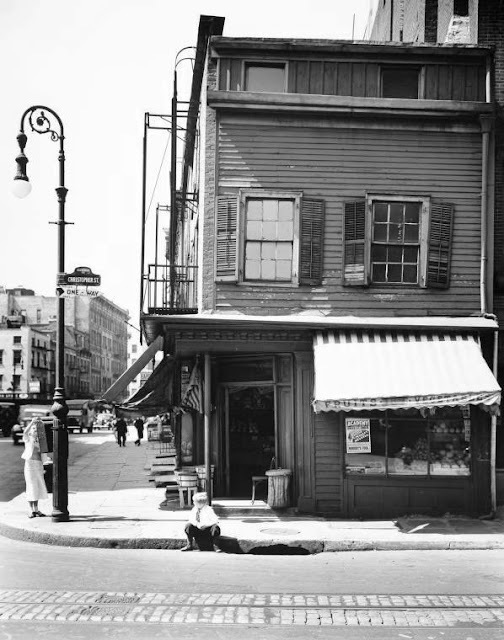 At the time there were only about three other homes along Herring Street – later to be renamed Bleecker Street – in one of which Thomas Paine boarded. The glint of historical importance for the little corner building was over in 1809 when the commissioners finalized their visionary street plan which would be published two years later. Things returned to normal on the corner of Christopher and Herring Streets. By now Greenwich was experiencing a building boom as Federal-style brick homes and businesses filled the streets. 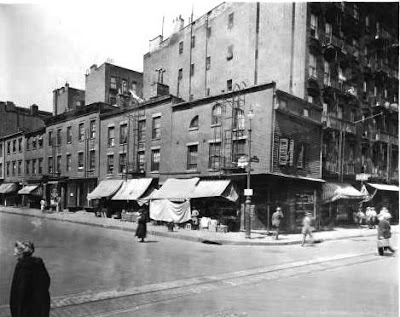 Herring Street was widened that year, taking away the corner building and the wall that had separated it from its neighbor at No. 93 Christopher Street. No. 93 got a new brick exterior side wall. Flanking the central, arched window below the cornice were two quarter-round windows, mimicking those that would be found below a traditional Federal-style pitched roof fashionable at the time. When Herring Street was renamed the following year, the corner property got a new address as well: No. 329 Bleecker Street. At the turn of the century Nicola M. La Rocca ran his fruit stand from here and for nearly a century the corner store would continue as a grocery. 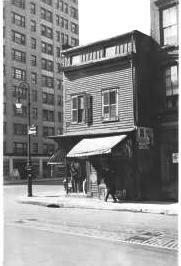 In 1922 Sam Ribyat, president of Ribyat Brothers, owned the store. He commissioned architect Thomas Williams to do renovations. Subsequent photographs show no cosmetic improvements of the Christopher Street façade; so it was probably at this time that the supporting tie rods on the Bleecker Street elevation, with their decorative iron star-shaped masonry supports, were installed. At some point the Christopher Street front was raised to a full three stories and the decrepit clapboards were stuccoed over. 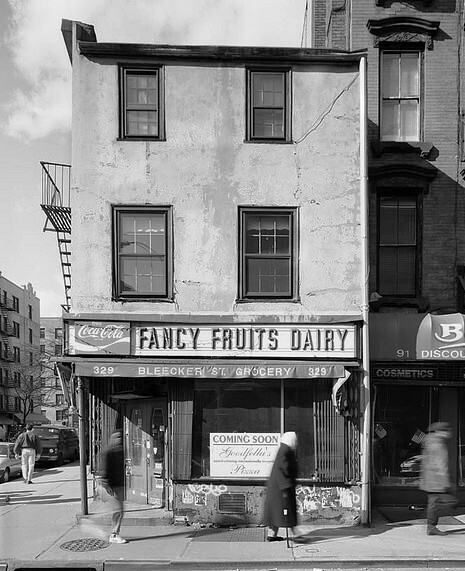 For decades the Bleecker Street Grocery's metal sign “FANCY FRUITS DAIRY” was a familiar landmark for Villagers. But as trendy shops and restaurants invaded the quiet, twisting streets of Greenwich Village so did high rents. The corner grocery was replaced by a rapid-fire succession of business—among them Bronca Pizza, Goodfellas Kitchen and Bleecker’s Corner, a fast-food deli. After decades in the same spot, the Bleecker St. Grocery was no more in 1997. The sign in the window portends the coming pizza parlor. Today the 200-year old store is sand-blasted and manicured; home to the UK-based chain store, Accessorize that sells glittery jewelry, belts, hair pieces, bags and cosmetics—far removed from the humble structure that sat on a dirt road in the first decade of the 1800s. For a good while, this was also the location of Hercule's Fine Groceries, the fine beer emporium just recently lost from Bedford and Seventh.